Harvest is nearly complete! 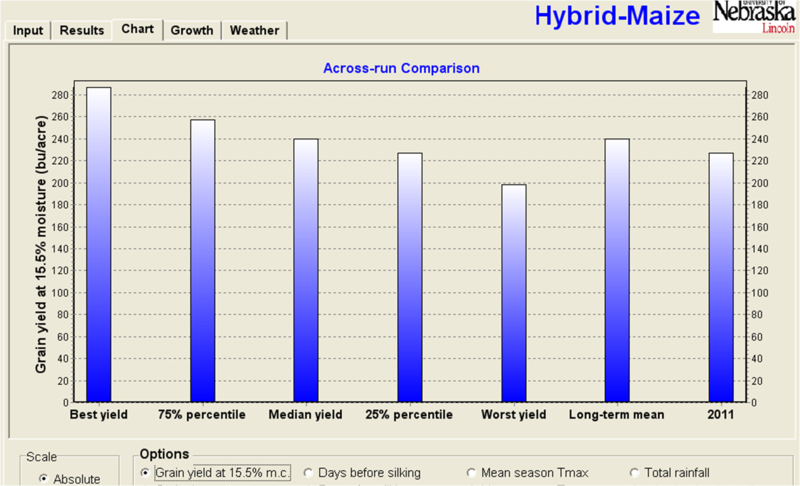 In early August, I shared a post regarding in-season yield predictions from the Hybrid Maize model. At that time, I showed how 2011 predicted yields had been tracking with the 30 year long term average yields up until early August. At that point, the 2011 predicted yields took a steep drop due to high night time temperatures. High night time temperatures don’t allow for the corn plant to shut down at night. The plant engages in respiration, essentially burning sugars that should be converted into yield. Some interesting things happened with the weather this year to make yields more favorable than what once was predicted. While silking to beginning dent occurred in 20 days or less in several Nebraska fields this year, the weather cooled off during the filling process. Some fields stayed at ¼ starch for nearly three weeks. Looking at fields, kernels continued to get deeper, heavier, and expand to help cover some of the pollination problems observed earlier in the year. During this time, yield predictions from the Hybrid Maize model showed that yields had the potential of returning close to the long-term median yields and it was interesting watching the trendlines move back up toward normal. This seemed to be truer for 113 day hybrids vs. 110 day hybrids. For example, a 110 day hybrid planted April 15 at 32,000 seeds/acre showed a predicted yield of 227 bu/acre compared to 240 bu/acre long-term median. But a 113 day hybrid planted the same day showed a predicted yield of 244 bu/acre compared to a 248 bu/acre long term median yield. So what happened in your fields? While yields have been decent, on average, I’m not seeing the trend towards the long-term median yields in our area in general. Dryland yields I think have been better than expected but irrigated yields potentially not as good as anticipated by many. 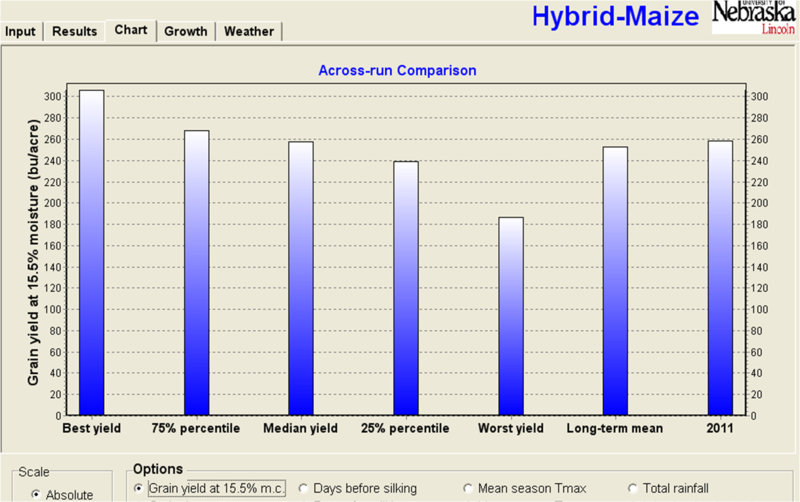 Hybrid Maize predicts yields based on perfect conditions-nothing limiting and no pest/disease issues. In many fields, corn was planted then sat in cool, wet soils. We had stand losses due to Pythium in some fields or due to loose residue that was piled in areas of fields after heavy rains. We also had varying degrees of pollination problems and the high night temperature stresses which reduced yields. Regardless, yields are still very good in spite of another interesting growing season! Please share what you’ve been seeing for yields in your fields! Posted on October 30, 2011, in Crop Updates, Discussion Topics, Reflections and tagged Agriculture, corn, Crops, Nebraska, yields. Bookmark the permalink. 2 Comments. I’ve found the Yield Data Center site has some relevant yield of corn data.